As it turns out, Berry71bleu has a challenge this month in collaboration with OUAS, using the same sketch. So, I made another layout based on it. The journaling is on the back of the tag under the photo. I really wanted it hidden, and the tag is double sided, which suited me perfect. Berry71bleu also had a rule to use chipboard on the layout, and a few of the pennants under the photo are chipboard ones. 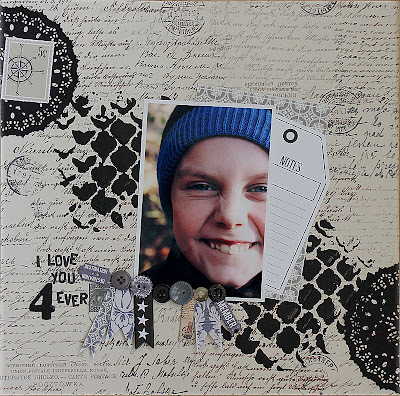 Also, it's really a perfect day to add this layout to the blog, because today is that little man's 10th birthday! Happy, happy birtday, my bright, sweet, amazing boy. I love you 4ever! Great page! Thank you for playing along with Berry71Bleu. I like your page a lot, thanks for playing with my challenge at Berry 71 Bleu! Pretty LO! Thanks for sharing with us at Berry71bleu. Great layout! Thanks for joining us at Berry71bleu! What a great page...love that photo! Thanks for joining us at Berry71Bleu! Temat Enkel. Temabilder från peeterv. Använder Blogger.